Oil on fabric. 90 X 77 cm. 1: Which is his emblem? 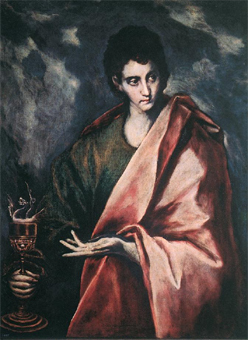 He is also represented with a cup poisoned by snakes by which they wanted to make him perish. 2: Author of the fourth Gospel, he is also the author of...? 3: Who is this character who killed the dragon in the Apocalypse and expelled Satan out of Paradise? He usually holds a sword with his right hand with which he killed the dragon, and in his left hand scales (balance). 4: What does it symbolize? 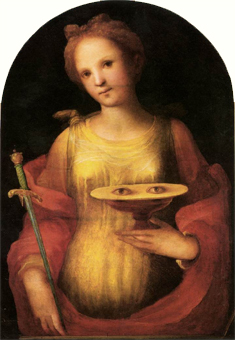 5: Which Christian woman of Syracuse, virgin and martyr, presents on a plate the two eyes that were torn off her? She refused a suitor to devote herself to God, and he, denounced her as a Christian woman. She was condemned to be raped. 6: Why is she sometimes accompanied by an ox? A She was often identified with the nymph Europa, who was abducted by Zeus metamorphosed as a bull. B It is an allusion to the oxen which refused to drag her to the brothel. 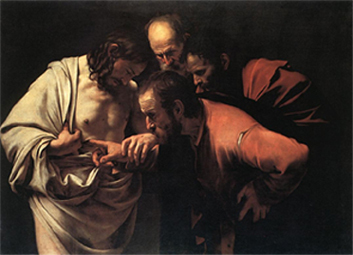 7: Which of these apostle is famous for the incredulity which he showed at the time of the resurrection of Jesus? Indeed, he was convinced only when Christ appeared to him for the second time, showed him the mark of the nails and made him put his finger in the wound in his side. 8: Which other element in remembering his martyrdom often forms part of the iconography of this saint? Oil on fabric. 107 X 146 cm. Oil on fabric. 201 X 134 cm. 9: Who is this John? He is generally represented dressed of a sheepskin, holding a long stick or a cross. 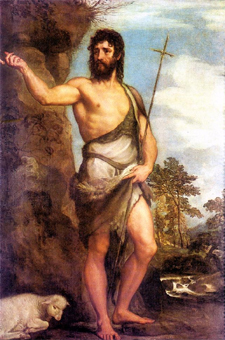 He is often close to water, because he gave the baptism to Christ on the edges of the Jordan; sometimes a dish at his feet represents the baptismal font. 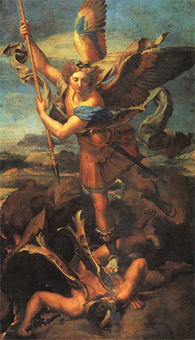 A pascal lamb is usually at his feet, as well as the dove of the Holy Spirit, which came down from the sky when he baptized Jesus. 10: Who asked that his head be brought to him/ her on a plate? Pass the mouse on the links to read the comment on the corresponding site. You can click on the links to open.